In the world of search, SEO features are always changing; it’s just the nature of our new existence. New technology, constant search engine updates, and an increasingly dynamic user base. Few things embody those three sentiments as much as smart speakers, which negate the need for keyboard or touch screens. Now, search users can find the answers to their questions by asking them out loud. Of course, smart speakers aren’t the only thing shaking up the search world. Google, always eager to make searching more efficient for its users, recently made life a bit easier with their addition of the “featured snippets.” The feature snippet is the block of text that will appear at the top of a search results (even above paid). The text that shows should provide an answer to the exact question entered by the user. For example, say I received a really impressive bottle of red wine, and instead of stowing it on the counter, I wanted to make sure it was stored as the perfect temperature. In the past, I could search “what’s the best temperature for red wine,” and I’d receive a page of sites that likely contained that answer. As you can see, Google was able to pull a snippet of text that immediately provides the answer. I don’t even have to click through. How are voices searches and feature snippets related? Voice searches are fueled by the feature snippets box (sometimes called “answer box”). Why is it important to optimize for feature snippets and voice search? From a traditional search aspect, the feature snippet spot trumps all other listings, including, as I mentioned, paid spots. Additionally, a site doesn’t have to show up as the first organic result to take the featured snippets cake. Claiming that spot for voice search results becomes even more important because tablets, smart phones, and computers are removed, at least visually from the equation, meaning that only the feature snippet matters in your voice search – not the rest of the search results. How do I optimize for feature snippets and voice search? Optimizing for feature snippets and voice search may seem impossible, especially since you’re vying for one specific spot, but there are ways you can increase the likelihood that puts placement zero (a.k.a. featured snippet) well within your grasp. SEO experts have long been forced to think in and about algorithms and bursts of keywords. But with voice search and featured snippets, that thinking pattern must shift. The traditional SEO rules are still valid, but if you’re looking to score the bonus points, you also must include a more human approach. That leads me to the next point – long tail keywords. Because the featured snippets and voice search results are chosen to answer a specific question, relevance is determined and results are triggered by the presence of longtail-keywords. Again, if you think of this as a very human approach to SEO, the importance of longtail makes sense. Not sure where to begin your research. There are plenty of great tools out there to get you started, including Answer the Public, WordTracker’s Keyword’s Questions, and of course, Google’s Autocomplete tool and “People Also Ask” feature (located below a featured snippet). Some of these words really shouldn’t be surprising, as the relationship between features snippets and terms like “recipe”, “make”, “best”, meaning”, etc. is a logical when viewed from a “conversational” approach. Asking the right questions also includes an analysis of your own content. What are you currently ranking for (top 10)? What types of questions are you qualified to answer? Pairing content relevance, page ranking, and likely triggers can help you ask the right questions. Asking the right question is merely half the battle. To really compete, you’ll need to craft short and concise answers in a small paragraph (think 250 – 300 characters), which would be used for the snippet, and then expand to create solid content that can better serve your users and boost your traditional SEO rankings. Experts also agree that the placement of that concise answer matters, suggesting that the snippet should be placed towards the top of the page, with the additional content following after. There are three types of featured snippets that may appear after a search: paragraphs, lists (bulleted or numbered), and tables. Paragraphs appear most frequently, and are the perfect way to quickly answer a who, what, when, where and why? However, lists are the perfect vehicle to answer questions that seek instructions or outline processes. Obtaining the first spot in a search result isn’t necessary to claim the featured snippet spot, but those who want a true shot at gaining the covered “0” placement will need to at least be on the first page of results. While it’s easy to focus on the snippet, it’s also important to maintain traditional SEO efforts that will show the relevance and strength of a page. This includes quality content, keyword research, and backlink efforts. In other words, don’t abandon your other efforts for the sake of a snippet. Google uses an algorithm to identify the most useful information for a featured snippet, but that doesn’t mean you can’t provide a roadmap to help. Include the question (query text) in your H tags, and always use the appropriate indicators for paragraphs (<p>) and lists (<ol>, </ul>). These small yet mighty HTML practices can make a big difference. According to Google, over 50% of searches take place on mobile devices, and that number is expected to grow. 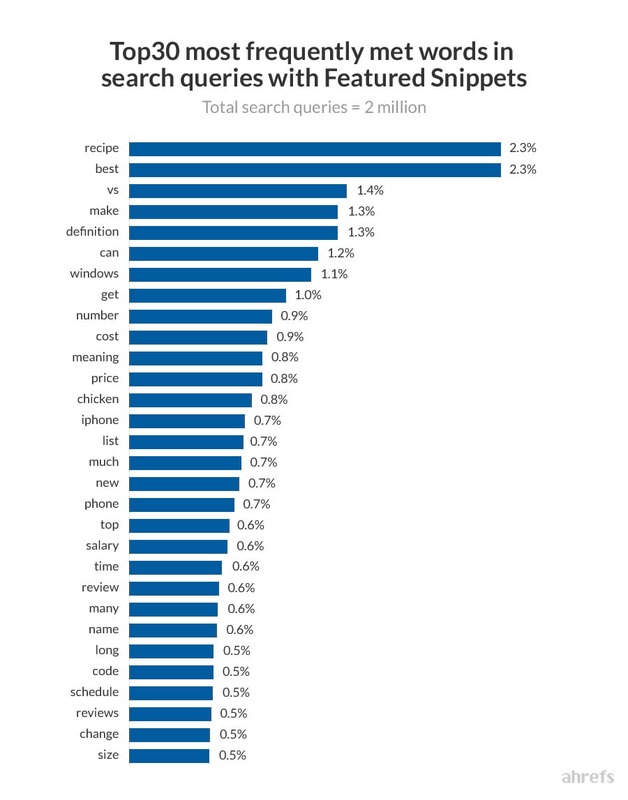 For those seeking feature snippet or voice search placement, this indicates a need to optimize for mobile. Of course, this should be a primary goal regardless of snippet status, but if you’re not already optimized, now is time to do so. If you are currently ranking in the top five for any of your keywords (or even the top 10), you definitely have a chance at reaching feature snippet status. Evaluate your current placement, and if you’re just out of reach for snippet placement, take a look at what site is in that spot, how they answer the given question, and how you may be able to improve your content and increase your chance of securing that spot. Voice searches made from mobile are three times as likely to be locally based, meaning those searching are looking for a product or service within a few miles of their current location. Register your business on Google My Business, and complete your local search listing, adding relevant info like the website, phone number, address, and hours of operation. Features snippets and voice search are proof that marketers who want to stay relevant in this continually changing world must adapt to the changing technology and the way it impacts search practices. Stay vigilant and take the steps necessary to make your content feature snippets and voice search worthy.